I have seen your cowardly threats, sent through your lawyers. Your board chairperson, Managing Director, Executive Director, your spokesperson and your PR agency; all have my phone number and email. This is either because I have either contacted them variously over the last couple of weeks or they have worked with me in various other capacities before- but either way, they could have reached out to me, instead of trying to blackmail me with these empty threats. This is not the first time and probably won’t be the last, but I will go ahead and defend myself, in the best way I know how to- with words. First of all I do believe these threats are aimed at gagging the media, considering that the recent Auditor General’s report showed that Bank of Uganda officials not only sold to you the failed Crane Bank under mysterious superfast circumstances and at a sweetheart price of Shs200bn payable over a period of 30 months and that the same officials either negligently and or intentionally failed to charge dfcu interest on this transaction; causing Ugandans, a loss of UGX39.5 billion. The same report also showed that BoU officials secretly transferred an undisclosed amount of Crane Bank bad loans to dfcu Bank – undisclosed because there was no agreement and or schedule of loans and the corresponding collateral. It has also since come to light that during this highly controversial sale, Bank of Uganda, Crane Bank (in liquidation) and dfcu shared and or continue to share lawyers- namely AF Mpanga (Bowmans) and Sebalu & Lule Advocates, at various levels of the transaction. It is also not a secret that some or all of these law firms, who are also debt collectors for dfcu Bank and or Bank of Uganda are also cashing on these debt collections, big time in form of 5% commissions. We also know- by the way from the media- that a certain Bank of Uganda official who presided over the Crane Bank sale, has lots of unexplainable riches. Maybe your threats to sue, should have started with a preamble explaining all the above issues to Ugandans. I know, all the above may be legal- for now, but that does not necessarily make them right. I have also previously received a news tip that because most of the fixed deposits dfcu inherited from Crane Bank have matured and at the same time dfcu has to keep meeting its payment plan to Bank of Uganda for Crane Bank as well as repay its shareholders for the bridging loan also used during the Crane Bank purchase and pay dividends- all the same time, this has choked your liquidity/cashflow. Because I know the significance of this story, I did not publish it, immediately, but rather chose to investigate it. I first received that tip on Wednesday July 18th and I immediately (at 11:06 AM) sent an email to BoU’s spokesperson, a one Charity Mugumya and copied in Dr.Tumubweine Twinemanzi-BoU’s new Executive Director, Supervision and Kelvin Kizito Kiyingi, the deputy BoU spokesperson. I particularly asked them to comment on the allegations that dfcu was having liquidity problems. I particularly put it to them that I knew Dfcu had dismissed the story, but I needed an independent comment from Bank of Uganda. I wanted to know, what would ordinarily cause such a sharp rise in just one year and whether it was a general industry problem or there were some particular banks affected? I also asked them, how short-term is short-term liquidity gaps? Without a response, three (3) days later, on Friday, July 20th, at 10:31 AM I again wrote to BoU reminding them that my questions were unresponded too. It was not until four (4) days later, on Tue, Jul 24, at 4:50 PM that I got an email from Kelvin Kizito, the Deputy Spokesperson of BoU. 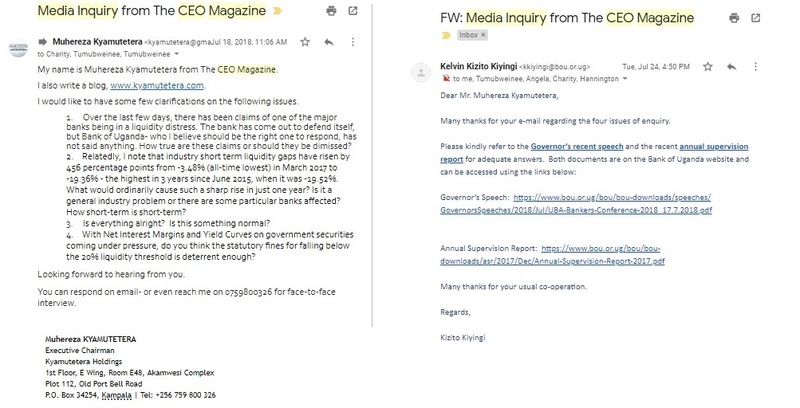 Kizito’s email did not specifically respond to my questions, as he simply asked me to refer to Bank of Uganda’s Annual Supervision Report (2017) and a speech that the Governor Bank of Uganda had made at the then just ended UBA Banker’s conference. I had read both documents extensively, but I gave them another read and there was no answer. Mutebile’s speech did not address my questions and the Annual Supervision report did not even cover, the period I was interested in (January 2018- June 2018), as it stops in December 2017. A few days later, BoU released its quarterly Financial Soundness Indicators report which showed that industry short-term liquidity gaps had further widened from -19.36% in March 2018 to -20.58% in June 2018- the highest in 4 years since December 2014, when it reached -21.16%. I also picked particular interest in the fact that Liquid Assets to total deposits fell 15% between December 2017. Liquid assets total assets have also fallen by 12%- even though industry were still generally above the regulatory limits. Even though deep in my heart I knew that she sharp falls must be driven by most likely one or two large banks having issues, I still could not get myself to publish the story to the effect that dfcu was having liquidity gaps- because I had no proof for it yet. However my journalism experience tells me that almost every time the Central Bank keeps quiet about certain issues, there is normally something wrong- something they think can be fixed and sometimes it does get fixed, but other times it does not. I am not that reckless, but I do believe that there is a big bank out there having issues- even though dfcu won’t admit they are the ones and BoU tell us which one it is- for obvious fear that this could prompt a run on the bank. There are industry regulatory thresholds for liquidity; all that BoU and or dfcu need to do is say something- put a figure to address the rumours. I do admit that some media houses have exaggerated some claims, but silence bleeds more suspiciousness, which makes bad situations worse. 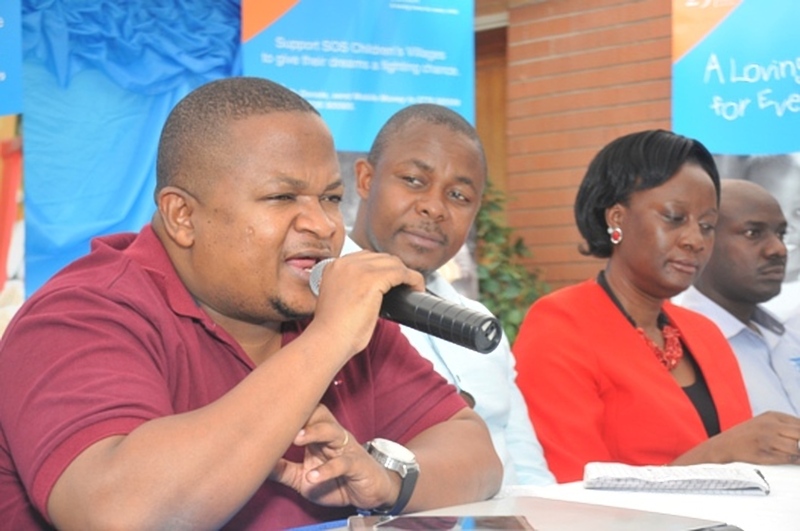 Lately, there has been a lot of bad vibe around dfcu- most of which was denied but later turned out to be true. Dfcu has spokespeople and should learn how to use them and not lawyers. Threatening the media with court action won’t yield much because every journalist knows that court suits is an occupational hazard. Or maybe a court suit is what is needed and we will then get Bank of Uganda to come and tell the truth.